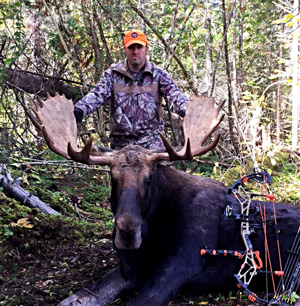 DENVER (February 10, 2016) – One of the hardest species tags to draw is a moose tag in Maine, but that doesn’t stop Brian “Pigman” Quaca of Leupold’s Pigman: The Series from getting it done. Season 7 of Pigman: The Series finds Quaca with a new best friend in Maine since that friend added him as the hunter on a Maine moose tag. Now, all Quaca has to do is draw back his arrow on a 1,000-pound bull. Easy, right? Season 7 of Leupold’s Pigman: The Series debuts exclusively on Sportsman Channel Sunday, February 14 at 8:30 p.m. ET. “Vsetko Umiera means to live through it and don’t forget where you came from – and to appreciate some of the things I took for granted. That’s not going to happen anymore,” said Brian “Pigman” Quaca. One of Quaca’s dreams is to bowhunt for moose and the best chance of getting one is Maine. Except for the nearly 20-year wait to draw a tag. But Quaca made a new friend: Seth Legere, firearms manager for Kittery Trading Post, during a recent visit to Maine. And Legere offered to add Quaca’s name as a subpermittee to his draw, which means if Legere’s name is drawn, Quaca can be the hunter. “I still can’t believe Seth did that for me. Unbelievable. I can never repay Seth for what he did. I might have to give him a lifetime of pig hunts in Texas,” said Quaca. It takes all of the five days allotted for the hunt and miles of walking, and calling, and walking. Quaca has two close encounters, but one bull caught wind of the hunters and immediately left while the other bull was just a baby. Will Quaca be able to add his name to the moose board in town? Or will the dream of a moose kill by bow stay that way for another 20 years? Also, coming up in Season 7: Pigman heads to Colorado for an antelope hunt with Fred and Michele Eichler where Quaca is still adjusting to his new bow set up. Plus, Quaca receives redemption when he’s invited back to Africa for a daytime bush pig hunt. Will success find him this time? MINNETONKA, MN; (January 8, 2016) — Season five of Winchester Deadly Passion with host Melissa Bachman returns to Sportsman Channel Sundays at 11:30 a.m. ET with a combo antelope – mule deer hunt in Colorado. This early season outing has Bachman bowhunting for antelope and velvety muleys – and even with the pre-rut bachelors running together, this spot and stalk challenges her. Tune in for great footage of big buck muleys on Winchester Deadly Passion, on Sportsman Channel Sunday, January 10 at 11:30 a.m. ET. “Over the years I’m always trying to figure out what hunt is best during what time of year. Late August and early September is a tough time, but I’ve discovered big, velvety mule deer and I’m going after them with Joey Menegatti of Story Creek Outfitters,” said Bachman. Bachman and Menegatti begin their hunt over a watering hole for antelope. But sitting in a hot blind for 12 hours can test any hunter’s patience. “For some reason, the antelope weren’t even coming in to the watering hole. You need great patience and be mentally tough to sit in a hot blind for this long,” stated Bachman. So the crew switches gears to something more physical – spot and stalking muleys. Even spot and stalking isn’t a guaranteed way to get a buck as Bachman and Menegatti find themselves within arm’s reach of one opportunity after another. “Viewers I think will appreciate the effort that goes into a spot and stalk bowhunt this early in the season – you have to be patience as maybe one in seven stalks actually works,” concluded Bachman. Outdoor Channel. Outdoor Channel has acquired the cable syndication rights to air the first six seasons of Duck Dynasty, the most-watched unscripted series in cable history, beginning on January 18, 2016 at 7 p.m. ET. The announcement was made today by Jim Liberatore, CEO and President of Outdoor Sportsman Group Networks. Outdoor Channel’s acquisition includes 71 episodes from the show’s first six seasons. The Robertson family return home to Outdoor Channel – where they got their television start with Duck Commander and where brother Willie Robertson currently stars on Buck Commander Protected by Under Armour – and will begin Duck Dynasty’s cable syndicated run with season one in January. 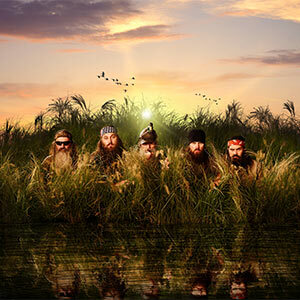 The Robertsons – brothers Phil and Si, along with Phil’s sons Willie, Jase and Jep – own and operate the Louisiana-based duck calling business “Duck Commander.” With Willie serving as CEO, the family has turned their signature beards and idiosyncratic personalities into a multimillion dollar business brand and iconic television series. Established in 1973, the company has grown from a “mom-and-pop” operation that creates fabricated duck calls and decoys out of salvaged swamp wood to a multimillion dollar sporting empire. Brad Holcman and Laurie Sharpe. Check local listings or visit www.OutdoorChannel.com/ChannelFinder to find Outdoor Channel in your area. NEW BERLIN, WI (June 16, 2015) – Sportsman Channel’s Big Game Wednesday presented by Wildgame Innovations is filled with big adventure, big bucks and big talent as the network presents its primetime slate of North American Whitetail, Destination Whitetail, Mathews Dominant Bucks, Buckventures’ The Woodsman, Big Deer TV and Bowhunter TV. The saying “go big or go home” has never been clearer when talking about Wednesday nights on Sportsman Channel. 8 p.m. ET – North American Whitetail: Hosted by legendary whitetail deer hunter Stan Potts and North American Whitetail magazine Editor Pat Hogan, North American Whitetail TV is not just about the hunt or the kill, but the process of growing, managing, holding and harvesting mature bucks year after year. 8:30 p.m. ET – Destination Whitetail: Host Lauren Rich and Brittney Glaze showcase the people, places and ways to hunt whitetail throughout North America…confirming no two whitetail hunters are the same. Along the way, the series takes a look behind the hunt to discover what makes each destination and its inhabitants so unique. 9 p.m. ET – Mathews Dominant Bucks: Join whitetail hunting pro Stan Potts and his team of Solo Cameraman Producers as they dive into the what, where, when, why and how of big buck hunting. 9:30 p.m. 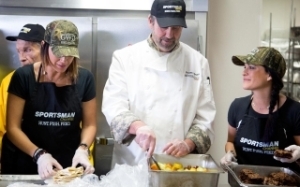 ET – Buckventures’ The Woodsman: Buckventures’ The Woodsman showcases four individuals making their life’s work in the hunting industry. There are many responsibilities when it comes to making partners happy (good footage, photos, big bucks) while trying to harvest the biggest bucks possible. 10 p.m. ET – Big Deer TV: Meet the Big Deer TV team – Mike Hanback and Eddie Stevenson – two great hunters with only one thing on their mind…big deer. They are out to prove when it comes to hunting monster bucks they are the best in the world. 10:30 p.m. ET – Bowhunter TV: Executive Vice President and Group Publisher Mike Carney and Editor Curt Wells provide running commentary in every episode. Mike and Equipment Editor Tony Peterson provide “Tech Talk” equipment insights; Pro Shooter Levi Morgan shares “Perfect Shot” archery advice; and all-world bowhunter Randy Ulmer closes with his popular “Dead On” segment. No matter the level of bowhunting experience or interest, Bowhunter TV has something to help viewers become better archers and bowhunters. About Sportsman Channel: Launched in 2003, Sportsman Channel/Sportsman HD is a television and digital media company fully devoted to honoring a lifestyle that is celebrated by millions of Americans. A division of Outdoor Sportsman Group, Sportsman Channel delivers entertaining and informative programming that showcases outdoor adventure, hunting and fishing, and illustrates it through unique and authentic storytelling. Sportsman Channel embraces the attitude of “Red, Wild & Blue America” – where the American Spirit and Great Outdoors are celebrated in equal measure. Sportsman Channel reaches more than 36 million U.S. television households. Stay connected to Sportsman Channel online at thesportsmanchannel.com, Facebook, Twitter and YouTube. NEW BERLIN, WI (June 16, 2015) – Justin “Iron Man” Greshko and Team Grenda face daunting obstacles in this week’s episode of Sportsman Channel’s Shed Wars. A spring snowstorm sweeps through the Rocky Mountains causing “Iron Man” more trouble than he bargains for and the Grendas are in for a surprise when Adam struggles to land their bush plane. Shed Wars airs exclusively Thursday at 8 p.m. ET/PT on Sportsman Channel. Greshko risks driving onto muddy roads to reach a location he has never shed hunted before. The unpredictable weather brings sheets of snowfall and after deeming the remainder of his trek too dangerous, he decides to head home. The spring snow takes its toll on the roads, and Iron Man’s vehicle won’t budge in the mud – leaving him stranded. Viewers also will catch a glimpse into the buying and selling of sheds, as Fish prepares to meet with “Antler Man” – one of the most well-known antler brokers in the country. Fish’s pile of sheds weighs in at nearly 4,000 pounds, but he worries tensions will rise if they can’t see eye to eye on pricing. NEW BERLIN, WI (June 8, 2015) – The heart of shed season has arrived and Team Grenda (Adam and Tana Grenda) could not be more excited. In this week’s episode of Sportsman Channel’s Shed Wars, the Grenda’s put their pilot’s licenses to good use on an aerial journey to shed hunt from a bush plane. Back on the ground, Brady “Bone Daddy” Dixon finds himself in an unexpected race for time. Shed Wars airs exclusively Thursday at 8 p.m. ET/PT on Sportsman Channel. By combining Team Grenda’s two passions – flying bush planes and shed hunting – they become an unstoppable team. Adam and Tana Grenda work together to pinpoint sheds from the sky, marking the coordinates with their GPS and tracking the antlers once they are back on the ground. It is an expensive endeavor, reserved only for the heart of shed season. Team Grenda hopes to discover as many antlers as they can from the sky, without losing their bearings once on the ground. “Your prospective from the sky is so different,” said Tana Grenda. “But that’s why we mark it on our GPS, because if we see it in the air, there’s no way to find it on the ground and try to navigate your way around. While Team Grenda hopes to gain an advantage over the other competitors from the sky, remaining teams continue their search for antlers on the ground – including Brady “Bone Daddy” Dixon. The intense hunter brings out his ATV for a more efficient antler hunt, but discovers even the most unsuccessful day can bring more shed hunting woes. While out scouting, Bone Daddy loses his ATV keys with only a moment’s notice to decide if he will continue to search or walk back to his truck as nightfall quickly closes in. NEW BERLIN, WI (June 2, 2015) – “These are the two hardest episodes I’ve ever filmed,” states Brian “Pigman” Quaca in the opening sequence of a special two-part event called “Pigman Rising” on Pigman: The Series, Sunday, June 7 at 8 p.m. ET exclusively on Sportsman Channel. “I am not sure if I was ready to come back. I may look a little different – I am still healing, but trust me in my heart I’m exactly the same. And you definitely don’t want to miss these two shows,” continues Quaca. The conclusion of the two-part event is on June 14 at 8 p.m. ET. Quaca also will host a Twitter chat during the episode and fans can ask questions using #PigmanRising and following @SmokinPork. 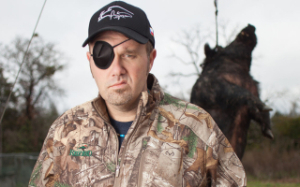 On Dec. 26, 2014, Brian “Pigman” Quaca nearly died in a horrific automobile accident on a snowy road in Colorado. The violent crash left Quaca critically injured, with devastating injuries that included 11 skull fractures, bleeding on the brain, cracked ribs and blood in his lungs. In this two-part episode, Pigman and his dad, Dap, go into great detail about the circumstances surrounding the accident, Quaca’s fight for his life and the numerous obstacles he has overcome – including severe nerve damage and significant vision loss. Viewers will follow Quaca along one of numerous doctor visits, acupuncture treatments and more as he, and Dap, struggle with their new reality. Seeing his son struggle, Dap finds Ret. Staff Sgt. Shilo Harris who has lived to tell his near-death story in his book Steel Will. While on patrol in Iraq in 2007, Harris’ Humvee hit an IED. That blast cost Shilo his ears, part of his nose, some fingers and over one third of the skin on his body – as well as three of his best friends. What Dap doesn’t realize is Harris is there not only to help get Pigman back out on his first hunt since his accident, but also to help heal the emotional wounds inside Dap and the entire family. NEW BERLIN, WI (June 1, 2015) – When the first episode of Sportsman Channel’s Shed Wars (Thursdays at 8 p.m. ET/PT) concluded, viewers were left on the side of a trail in the Rocky Mountains with The Rack Pack (Josh Yandle and Justin Lottman) wondering how they were going to scale the dangerous Rocky Mountain ravine in the pitch dark with limited light available or be forced to spend the night in the wilds. When viewers returned for the second episode, expecting to see how Yandle and Lottman managed to escape the danger-filled scenario, the scene was curiously absent of explanation. Reality collided with “reality” when a member of the True Sight Media production team – cameramen Forest Cox – fell 35 feet down the side of the mountain ravine while trying to shoot the scene – in the dark – for episode two. Cox’s fall resulted in the camera getting destroyed but, luckily, he was not seriously injured. The hearty cameraman did suffer a bruised spine, sprained wrist and swollen ankle but managed to return the next day to shoot more episodes. 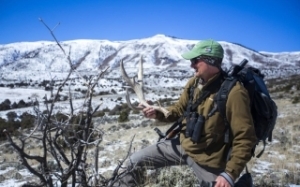 Sportsman Channel’s new original series Shed Wars follows the adventures – sometimes dangerous – of five teams vying to compete for the skyrocketing demand for antler sheds in the Rocky Mountains. The underwhelming supply of sheds – with high demand – has turned the opening of shed season into one of the fiercest competitions the great outdoors has ever seen and sometimes life threatening. The five teams provide viewers a glimpse into what it takes to survive the entire shed hunting cycle. Through months of preparation and challenging Rocky Mountain terrain, they risk it all in the pursuit of the ultimate pay day. Catch a sneak peek: http://bit.ly/1DUkHgW. Bone Daddy – Brady “Bone Daddy” Dixon (Fruita, Colo.) is always convinced the next big score is just around the bend. Dixon is relentless in his pursuit for the next record breaking shed set. Love him or hate him, it is his way or the highway. Fish – Fish Fisher (Bozeman, Mont.) has a long history of shed hunting. With the good book at his side, he is out to share the message and stack some bone. Team Grenda – Bush pilot Tana Grenda, her brother Tom and husband Adam (Bonners Ferry Idaho), are all about having the upper hand. With ATVs, snowmobiles, dogs and an airplane at their disposal, they can overcome any obstacle standing in their way, and claim the hardest to reach shed piles. 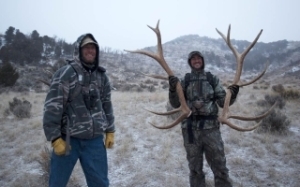 Iron Man – Justin “Iron Man” Greshko’s (Edwards, Colo.) obsession with antlers keeps him awake at night. With the agility of a mountain goat and the veracity of a bear, there is no mountain that can contain him. NEW BERLIN, WI (May 4, 2015) – With eyesight estimated to be eight times greater than a human’s, and a wingspan up to seven and a half feet wide, it is no wonder Remi Warren, host of Sportsman Channel’s original series Apex Predator, is fascinated by the Golden Eagle’s attributes and ability to hunt. This week’s episode takes Warren inside the mind of the massive bird in an attempt to mimic its predatory style using modern optics in pursuit of the elusive Mexican Coues deer. Apex Predator airs Thursday, May 7 at 8 p.m. ET/PT exclusively on Sportsman Channel. Humans have long been fascinated by a bird’s ability to fly, and the coveted “bird’s eye view” it provides. It is an advantage birds like the Golden Eagle use on their quest to survive – to discover and devour prey. Warren hopes to gain that advantage, but before heading out into the mountains of Mexico, he must learn what it takes to obtain vision so powerful, medium sized prey become visible from up to two miles away. 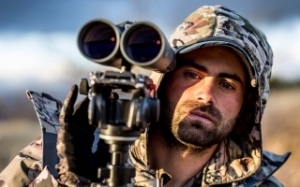 Warren has the opportunity to use modern optics to assist in his hunt, but he lacks the luxury of flight and the ability to dive down to the ground at speeds of up to 150 miles per hour. Warren journeys to higher ground, but when a Coues deer appears, will the apex predator reach his prey in time? “Even as a hunter who uses optics and hunts like this a lot – I learned something new,” admitted Warren. “I got up high in the mountains, I glassed, I tried to keep as true to the way the eagle would spot things as I could. I’m thankful that I learned this lesson and I feel pretty darn excited about everything I got to experience. Follow along with @RemiWarren and @ApexPredatorTV on Twitter for a LIVE tweet throughout Thursday’s episode of Apex Predator at 8 p.m. ET/PT. About Zero Point Zero: Zero Point Zero Production is an award-winning production company located in Manhattan. Founded by Executive Producers Chris Collins and Lydia Tenaglia in 2003, with Partner and Managing Director Joe Caterini coming aboard in 2009, Zero Point Zero has produced hundreds of hours of television in over 80 countries around the world, and has created original content for CNN, PBS, Discovery Channel, The Weather Channel, HLN, History, and Travel Channel. ZPZ is currently in production on Anthony Bourdain: Parts Unknown (CNN); The Hunt with John Walsh (CNN); City.Ballet (a co-production with Sarah Jessica Parker/Pretty Matches for AOL On Originals); the two award-winning series, The Mind of a Chef (PBS) and MeatEater with Steven Rinella (Sportsman Channel); and The Getaway (Esquire/NBC). Visit www.zeropointzero.com for additional information. About Sportsman Channel: Launched in 2003, Sportsman Channel/Sportsman HD is a television and digital media company fully devoted to honoring a lifestyle that is celebrated by millions of Americans. A division of Outdoor Sportsman Group, Sportsman Channel delivers entertaining and informative programming that showcases outdoor adventure, hunting and fishing, and illustrates it through unique and authentic storytelling. Sportsman Channel embraces the attitude of “Red, Wild & Blue America” – where the American Spirit and Great Outdoors are celebrated in equal measure. Sportsman Channel reaches more than 34 million U.S. television households. Stay connected to Sportsman Channel online at thesportsmanchannel.com, Facebook, Twitter and YouTube.